Well, it's been crickets chirping here for a few months. I cannot believe how fast time flies by - it's just like my parents said it would be. 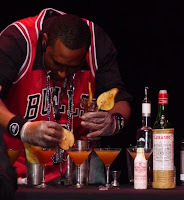 Well, I'm going to do better on the blogging front, and I'm starting off with a post about a recent cocktail competition here in Chicago. 42 Below Vodka sponsors a cocktail competition each year in a variety of cities around the globe, and the Chicago round was last week. Unlike many competitions, this one is judged based primarily on the taste of the drink and the competitor's performance while making it. I've missed the competitions in past years, but have heard stories of costumes, singing throughout the 5-minute time limit, and various other stunts to win. So I had to go this year and check it out. 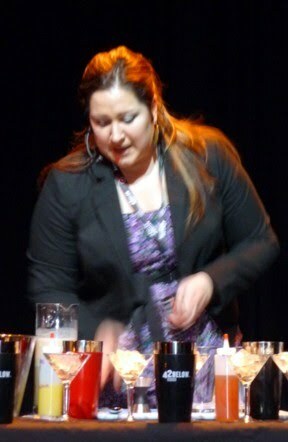 The event did not disappoint - it was fun and fast-paced, with a variety of cocktail styles and performances. Since the sponsor is a vodka brand, of course all recipes involved vodka, and interestingly, many used the straight version, not the flavors, which are a bigger differentiator for the brand (Manuka Honey, Kiwi, Feijoa, etc.). "The Beet Martini" made with the straight vodka, beets, caraway syrup, grapefruit zest, and creme fraiche caviar. Much to my surprise, it did not taste very "beet-y," which was a good thing because I don't like beets. "Fall in Loooooooove" made with cinnamon and cranberry-infused vodka, fresh lemon, bitters, and agave syrup. Delicious and seasonal, with dominant cinnamon notes. 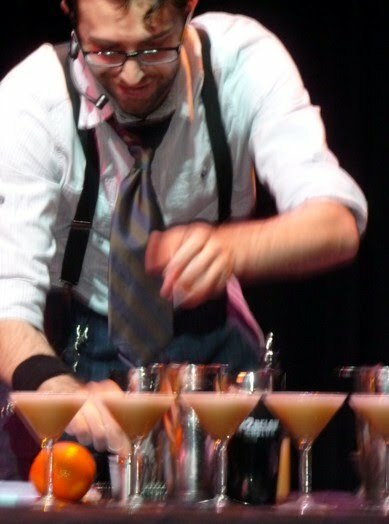 Milan wore a fantastic mask, and managed to make all of his drinks on time and without spilling, despite the mask. "The Black Widow," made with the manuka honey flavor, horchata and some other ingredients that I unfortunately missed. It was a classic dessert-style drink, sweet and creamy. Andy Gold from Bonny's Bar a/k/a the "Boston Brawler"
Andy was fun to watch, he was witty and funny while making "The Pigeon and the Squirrel." 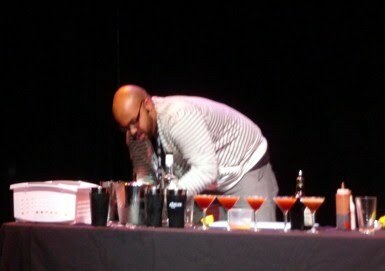 He used the straight vodka and Koval rose hip liqueur, Chartreuse, fresh grapefruit and egg white. It was herbaceous and complex, with nice texture. I missed the name of Dante's drink, but he used Bonal Gentiane-Quina, jasmine tea, and egg white, with a fresh orange zest garnish. The drink was balanced and tasty. 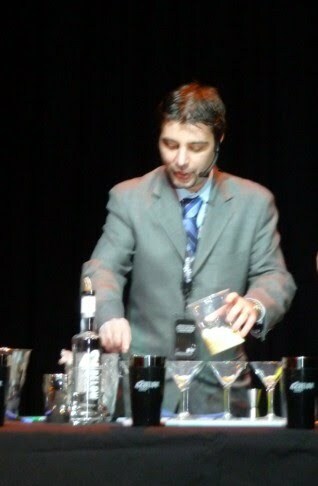 Andre was quite funny and energetic during his cocktail-making session, and had the crowd laughing. 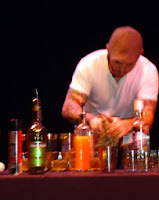 For his cocktail, he used the plain vodka infused with pear skins, Luxardo Maraschino, red chili simple syrup, rhubarb bitters and fresh lime juice. His garnish was a bruleed pear in vanilla sugar. Bryson's "The Sweetest Light South of the Equator" contained an unusual combination of ingredients, using the plain vodka, blanco tequila, creme de banana, spiced rum, and icewine. I must admit I was skeptical on hearing the ingredients, but it was better than I had expected. Sweet, but with some interesting, complex flavors. 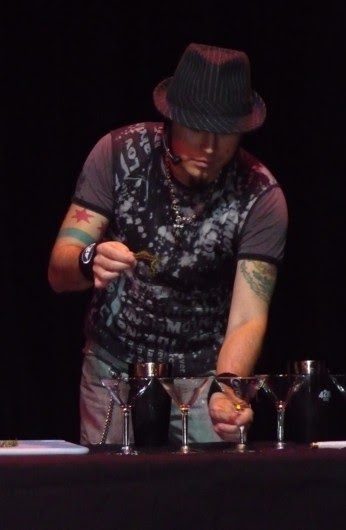 Tim was the only competitor to bring on-stage assistants, and he took the event's "Cocktail Carnival" theme to heart. He brought his very ow n carny with a bull horn, as well as a lovely assistant making cotton candy garnishes (played fantastically by his wife Lisa). 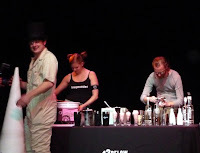 Tim used the Manuka Honey flavor, as well as honey syrup, lemon juice, apricot liqueur, ginger beer and tiki bitters. His "All Sales are Final Void Where Prohibited by Law" was delicious, balanced, and complex, and seemed to actually play to the flavor of the vodka. While he didn't have on-stage help, Sergio instead brought Capoeira dancers to accompany his drink making and music, and they were great. 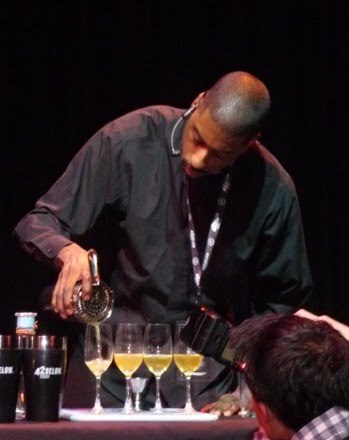 He used the Kiwi flavor, along with fresh lemon, green tea syrup, falernum and a flamed thyme garnish (soaked in Chartreuse). Unfortunately, I didn't get to taste this one - I'm sure it was great. While he didn't have dancers or stagehands, Tim was funny and witty, and brought his mom along for good luck. Tim used the plain vodka, ancho chile-infused honey, Cherry Heering, fresh lemon juice and candied lemon peel for garnish. His "The Federale" was spicy, smooth and complex. The competition was fierce, and the judges had some tough decisions to make. 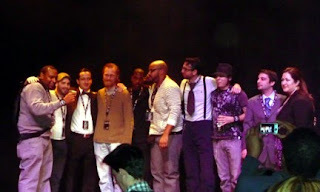 And the host made it tough on the two Tims when he announced the winner. He said it's "Tim........." and drew it out for a long time. Luckily, the winners were Tim Lacey AND Tim Williams. Congrats to Tim and Tim, who are off to New York City next month to fight for the national title and a trip to New Zealand!